After a successful 30th Anniversary set, Topps took a 6 month break before offering collectors a new set. With the release of 2016 Garbage Pail Kids As American As Apple Pie In Your Face, Topps kept some changes they made with the 30th set, while at the same time completely changing the way other aspects of the release is handled. Returning once again is the large 220 base card set, broken into different subsets with card numbers on the backs. Topps decided to completely revamp the parallels not only in look and name, but also numbering many parallels on the cards backs for the first time in a regular GPK set. Familiar inserts and “hits” also return to the series. Topps also decided not to print checklist card backs for this set. Topps did release a checklist which you can find here. Production is way down on this set compared to the 30th set. I’ll have a couple of articles breaking down production numbers in the coming days. 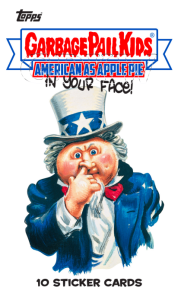 For now here is what you can find in 2016 GPK Apple Pie! This entry was posted in 2016 GPK Pie, Odds, Uncategorized and tagged 2016 GPK Pie, Odds by Jeff. Bookmark the permalink.